Close to a hundred people died in a major fire that engulfed the Advanced Medical Research Institute (AMRI) Hospital in Kolkata on December 9. Majority of them were patients, in so critical a condition that they could not even move their limbs. They helplessly saw smoke enter their cabins as they suffocated to death. Those administered sedatives died in sleep. The cause of fire is still not known. What’s known is that despite warnings, the hospital had not taken steps. On September 5, the Kolkata fire department had inspected AMRI Hospital and pointed out the loopholes. The hospital merely promised to take corrective steps within 90 days. The tragedy occurred just before the deadline was to expire. 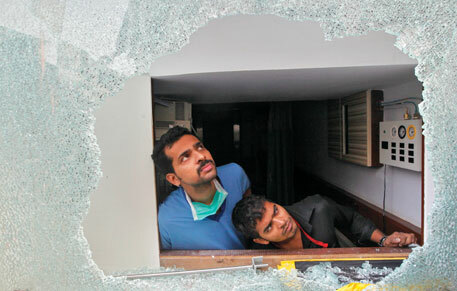 The fire at AMRI Hospital is not a one-off case. In 2001, at least 25 mentally ill patients were charred to death in a hospital at Erwadi in Tamil Nadu. Chained to their beds, they could not have escaped. In fact, AMRI Hospital too had witnessed a minor fire on its ground floor in 2008. Despite the grievous losses, the Centre could not act because fire safety is a state subject. And clearly, making hospitals fire-safe is not a priority with the state. Delhi is a case in point. The Delhi Fire Service (DFS) has declared 27 blocks in the city’s different hospitals—16 run by government and 11 by private firms—unsafe. As per rules, DFS can seal a building that does not have a no-objection certificate (NOC) issued by it. But none has been sealed. Manoj Sharma, spokesperson of DFS, argues that most buildings are in the process of procuring NOCs. Between April 1, 2006, and March 31, 2011, Delhi hospitals witnessed as many as 106 fires. A possible reason could be that over 500 hospitals countrywide are awaiting accreditation from the Quality Council of India (QCI). The body accredits buildings for their quality service under the National Accreditation Board for Hospitals and Healthcare Providers certification. “But 50 per cent of the hospitals, for sure, will not have at least one of the four crucial licences required,” says Giridhar Gyani, director of QCI. The crucial licences are—building permit, NOC from chief fire officer, NOC for biomedical waste management from the pollution control board, and Atomic Energy Regulatory Board’s approval to run radioactive machines. QCI grants accreditation only if a building meets 72 legal requirements. For fire safety, it checks four main points—mechanism for early detection and abatement of fire, a safe exit plan, a staff trained to tackle emergencies, and mock drills twice a year. Gyani says hospitals can easily cheat. For instance, there is no way to check whether mock drills have been conducted twice a year, he says. According to the National Building Code, 2005, hospitals are classified as institutional buildings, and therefore require equipment like extinguishers, hose reels and automatic sprinkler system. At all times, the area around a hospital building must be kept clear for easy access of fire tenders. The entry gate should be at least 5.5 metres wide, lanes around the hospital six metres wide and the turnings nine metres wide. The staircases should be two metres wide and the corridors the width of 2.4 metres. The hospital building should be no more than 30 metres high to make evacuation of patients easy. All hospitals must have a ramp. M Mariappan, associate professor at the Centre for Hospital Management at Tata Institute of Social Sciences, Mumbai, says, “Accidents occur due to negligence.” But the alarm bells simply don’t ring in the administrative circles.